Cryptocurrency specialist CryptoSlots.com is on fire this week. 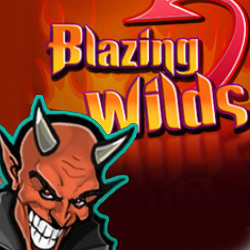 The online casino has just added a sizzling hot new slot game called Blazing Wilds. It has fiery Expanding Wilds to increase wins and a scorcher of a Free Spins Bonus game where there are extra Wilds and wins on Payline 13 are doubled. Until Sunday, CryptoSlots is topping up deposits by up to $150 to give players extra play time on the fiendish new game. This week there’s also a 20% bonus for playing all other slots and keno. Blazing Wild’s Scatter – a satanical Goat symbol – can trigger up to 13 free spins. Wilds appear more frequently during free spins. Hitting Bonus symbols during free spins wins more free spins, and all wins on the middle line -- Payline 13 -- are doubled. A High Limit version of this game has been popular at Cryptoslots since it launched last summer so the casino has added this version with a lower betting range $0.30 - $9.60 per spin). May be redeemed 4x per day. Wagering requirement 35X. Valid for Blazing Wilds only. May be redeemed 2x per day. Wagering requirement 35X. Valid for all slots and keno only. In addition to Bitcoins, Bitcoin Cash and Litecoins, Cryptoslots now accepts Monero (XMR) for deposits and withdrawals as well. Blazing Wilds joins 25 other provably fair slots (some high limit), 9 video poker games and one million-dollar jackpot game. When they play slots and video poker, CryptoSlots players automatically earn tickets for the casino’s monthly Crypto Lotto with a first prize of at least $10,000.